Originally used to haul deadly .50 caliber firepower, this solid metal U.S. Military Ammo Box is ready for a second tour of duty. Great for protecting your ammo or other gear during transport or long-term storage. 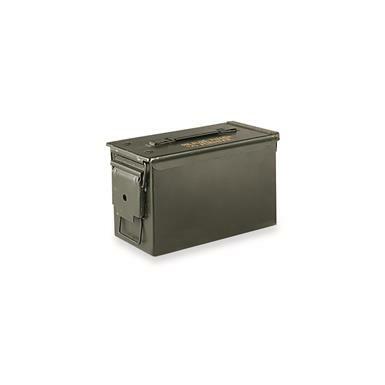 Dimensions: 12" x 6" x 7.25"h.
U.S. Military Surplus Waterproof M2A1 .50 Caliber Ammo Can, New is rated 4.7 out of 5 by 35. Rated 3 out of 5 by Dan_ from Have bought used for less with less surface rust “New” must really mean unissued, stored in a damp basement with the lid open. Have bought these in the past (used) from SG for less $ in better condition. They are serviceable but I would not qualify them as new, they have mars and surface rust inside and out. The “used” discount offer ammo can with count down timer during check out was an impulse buy that I really did not need to make. That ammo can was so severely rusted (inside and out) that I am hesitant to even try to repair it. I have read reviews the past alluding to the lacking quality of this particular product but have been fortunate until now not to have experienced it first hand. Rated 5 out of 5 by ANTHONY from Brand new can. Not much else to say.Rubber seal was undamaged and provides an excellent seal for ammo, primers, and powder. Lid latch locks down tight providing a good seal. Can has S.C.F. stamp on end indicating it's not a Chinese knockoff. Rated 3 out of 5 by seac from Ammo can good construction and in good shape, but no marking or printed word as shown on the picture, kind of disappointed since that's why I order this piece instead of those lower price one or what I found locally. Rated 2 out of 5 by Sherry from I Guess It's How It's Made Not too impressed with this product. Can was painted and paint was left dried in clumps all over the item and some of the paint was even scratched off. The top had a scratch down the lid. For a new item I would not recommend. I could of bought one used if I wanted this look. Rated 5 out of 5 by Daniel from Just what I needed Cans are new, no dents, worked fine. Great for storing various things. Prices were a little high, but it was offset by free shipping. Rated 5 out of 5 by 41 Willysman from No worries New can and new seal, no leaks or deterioration which is worth the extra price over the surplus, used items which may or may not have rust or old seals. Stackable organization for your workshop. Convenient liquid transport, at a bargain price!